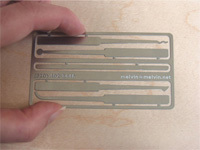 Credit-Card Sized Lockpicking Set | OhGizmo! Business cards are so yesterday. 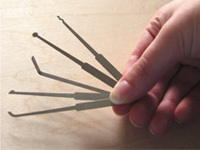 What you want to be carrying in your wallet is this: a credit-card sized lockpicking kit. It’s a design by Jeni Mattson, and it looks like it’s cut right out of a sheet of some sort of metal. Maybe stainless steel? New Spanish site with lots of videos opening direfent locks with picks, pickGuns and Bumping methods.